1.Promote better understanding of the role and the characteristics of technology universities across the world. 2.Collaborate on research and knowledge transfer to address global challenges. 3.Develop position and policy statements. 4.Facilitate links between world technology universities and industry, NGOs and SMEs. 5.Share best practices, and provide opportunities for capacity-building among members. These objectives will be accomplished through exchanges between member universities; collaborative research between member universities; and facilitating links between world technology universities and industry, NGOs and SMEs delivery of an annual Congress, hosted by a member institution around the world. To facilitate this, the Network members meet once in year during the World Technology Universities Congress. The 3rd World Technology Universities Congress was hosted jointly by Hindustan Institute of Technology and Science and Indian Institute of Technology (Madras) between 28th and 30th Nov. 2018 in Chennai. Around 100 participants from partner Universities and Universities desiring to become members registered for the Congress. The 2018 Congress included sessions featuring global university, business, and industry leaders discussing current and future challenges facing the world and the role and responsibilities of universities taking multi-disciplinary approaches to respond to these challenges. The 3rd day of the World Technology University Congress was held at Hindustan Institute of Technology and Science, Chennai on 30th November 2018. Delegates from 28 universities across the globe participated. 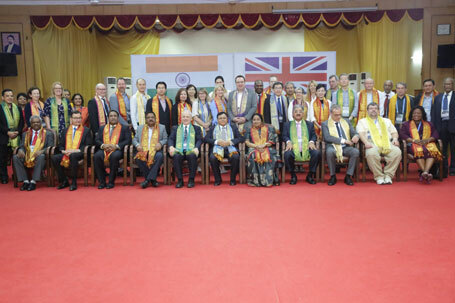 Professor Brian Cantor, Vice Chancellor, University of Bradford, Chair of WTUN attended the programme along with the dignitaries of the various universities. 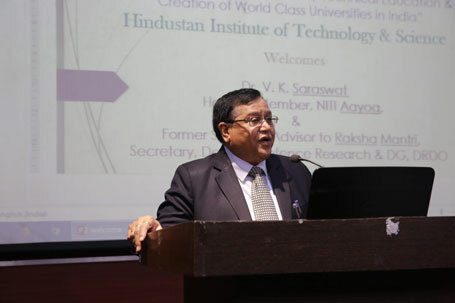 The sessions commenced with a Board meeting and was followed by a talk by Dr. K. Saraswat, Honourable Member of NITI Aayog, Former Scientific Advisor to Rashtriya Mantri, Former Secretary, Department of Defence, DRDO related to Higher Education. 1.Old education failed to inculcate creativity. 2.No institution ever taught missile and weapon making to us. We learned ourselves through our own efforts. 3.Economic development of a nation will depend upon how we shape ourselves first. 4.Sustainability will be the key for future. It should make everyone realize the importance of minimized use of energy. 5.Failing to train students in right way will ruin their career as well. 6.Students on the other hand don’t want to soil their hands to learn something new, they always want things in an easier manner. Teachers have to inculcate research ideas in students and they should constantly encourage students to think differently. 7.Research is generation of Knowledge. Knowledge promotes innovation. Innovation brings change to a country. This is the vision of Honourable Prime minister of our country. 8.After completing Ph.D. the candidates never bother about their research. Every research must have relevance to the society. Doing a repetitive research neither contributes to science nor to the society. Relevant research should lead to translation. From there it should lead to innovation. 9.Institutions that do not encourage research will be doomed soon. They should create proper research eco system to encourage collective wisdom. Resources, Eco system and Value creation centres are requires to consult and promote research. 10.Teachers must make their students translate an idea into an engineering product. Project based instruction will make them realize the seriousness of the topic. 11.Demands of sustainability are important for students to be aware of the future. 12.Collaboration with various engineering disciplines has become integral part of student learning today. This will allow a student to understand and appreciate engineering in a different perspective. 15.Ethics, ethical behaviour, sincerity, passion, devotion and spirituality are very important to a teacher to respect your profession. The third day of the WTUC concluded with a networking and lunch session followed by honouring the delegates of WTUC3, by the Management of Hindustan Institute of Technology and Science. An MOU was also signed by Mr. Ashok Verghese, Director HITS and Vice Rector and President of UFRN University, Brazil.